Power Pop Heroes is not just the name of rock journalist and musician Ken Sharp�s recent multi-volume book series � an oral history of the critically-beloved musical style interviewing some of its biggest stars � it also is an accurate description of Sharp and his band. That band has become a well-tuned machine, as Sharp and co-producer (and in-demand session player extraordinaire) Fernando Perdomo shape 16 of the catchiest slabs of sound in Sharp�s long musical career. Also, like his previous release, some of Sharp�s heroes laid down some parts for the new album, this time including Ace Frehley (KISS), John Oates (Daryl Hall & John Oates) and Kasim Sultan (Utopia). Beauty in the Backseat continues a spurt of productivity for Sharp. It�s the second full-length album (plus a few stand-alone singles) released in about two years. By comparison, it took six years each between his first three albums (which were released in 1995, 2001 and 2007), and nine years before the last album New Mourning. The new spate of recording, and live performance has honed some of the finest songs and performances in his already impressive body of work. Other styles include the acoustic psychedelia of �Jet Fighter,� the arena rock chops of �No One Seems to Stay Together Anymore� and the dreamy ballad �Sinking.� And �The Hardest Part� may just be the most supremely gorgeous pop groove that Sharp has uncorked yet. Beauty in the Backseat shows a songwriter hitting on all cylinders. It�s arguably Sharp�s best work yet. Copyright � 1995-2018 PopEntertainment.com. All rights reserved. Revised: October 14, 2018. The power pop underground keeps on keeping on although the musical style has never captured the audience that its most rabid fans feel it deserves. A delirious mixture of rock crunch and bubble gum beats that has flirted with mainstream success since the 70s, the style has spawned such respected short-term stars as Jellyfish, Matthew Sweet, The Knack, Marshall Crenshaw, The Romantics, Dwight Twilley, The Rubinoos and others. In fairness, some power pop artists did spawn pretty long careers: The Cars, Rick Springfield, Cheap Trick, The Bangles, etc. However, the style has never gotten its due. It did not go away, though, it just went underground. To this day, there is a thriving power pop scene in Los Angeles and spread around the world. We feel quite lucky to be intimately involved with one of the better talents of the style. Ken Sharp is a long-time PopEntertainment.com contributor as an interviewer and reviewer. He has also written dozens of books about popular music history including KISS: Behind The Mask, Overnight Sensation: The Story of the Raspberries, Reputation Is A Fragile Thing: The Story of Cheap Trick, Elvis: Vegas '69 and Starting Over: The Making of John Lennon and Yoko Ono's Double Fantasy. However, Sharp is not just one of those dry academics who knows everything about music, except how to make it. He walks the walk and talks the talk as a stellar power pop singer/songwriter. New Mourning is Sharp's fourth CD, his first in nine years. It is also by far his most diverse and strongest disk yet. It also features guest appearances by such power pop luminaries as Rick Springfield, guitarist Wally Stocker of The Babys, bassist Prescott Niles of The Knack, Rob Bonfiglio of Wanderlust and Wilson Phillips and Ritchie Rubini of The Caulfields. We admit straight up that we are a tiny bit biased toward Ken's music. Not to worry, though, we would not recommend New Mourning if it did not have the goods, and for sure it does. The new album allows Sharp to reach out into some new musical waters � check out the new wave electronic beats of "Satellite" � and yet he still can do a spectacularly gorgeous break-up ballad like "Put the Blame on Me" or a near-perfect hooky sixties pastiche like "Solid Ground." He also touches on arena rock � is it my imagination, but is the intro to "Dynamite and Kerosene" a little nod towards The Grand Illusion-era Styx? � before he up-shifts into a more traditional hooky grandeur. On the other hand, "Bad News" is a sweet marriage of Byrdsy jangle pop and British Invasion propulsion. "Loser" is a wonder of studio overdubbing, starting with a theatrical intro straight out of The Phantom of the Paradise before downshifting into a gorgeous bit of electric light introspection. Any one of these songs feels like it could have been a hit on the Billboard charts in the 60s or 70s. It's just that kind of party. 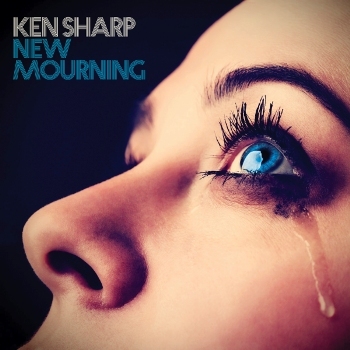 Ken Sharp may have been born in the wrong era, but thankfully he keeps bringing that era's music back to us. Copyright �2016 PopEntertainment.com. All rights reserved. Posted: July 2, 2016. 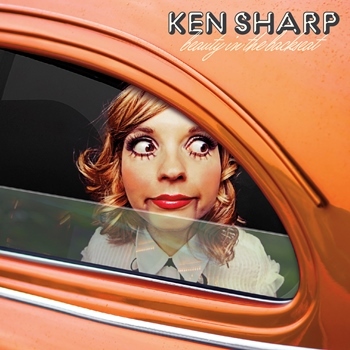 Okay, we�ll be the first to admit that maybe we�re a bit biased, because pop singer/music journalist Ken Sharp is a frequent PopEntertainment contributor and we�ve been following his music career since long before he joined us, but the man does have a way around a pop music hook. 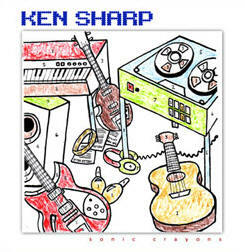 Sharp�s third CD, with the evocative title Sonic Crayons, continues his self-appointed job as curator of an aural museum of 70s power-pop, with brightly memorable hooks and sweet harmonies around every corner. Sonic Crayons is full of tunes that would sound amazing blasting out of a transistor radio. It�s the musical equivalent of Captain Crunch � with extra Crunch Berries. If you grew up listening to 70s bubblegum hits (or even if you jumped on during the 90s mini-revival) Sonic Crayons gives you an immediate sugar rush of memory. It�s a passport back to your childhood. say, the new Korn or OutKast album. And thats a damn shame. Musically and production-wise, Happy Accidents is quite a step up from his already very good debut album 1301 Highland Avenue. Happy Accidents has a more psychedelic feel than his debut album, but more importantly it has a more sure-handed grasp of its musical ideas. "See Through These Eyes" is a stunner, a mixture of driving vocals and a terrific guitar line and truly clever retro lyrics. "Brand New Day" rides a springy Stevie Wonder-obsessed guitar line through three minutes of pop bliss. On the evidence of his debut disk, singer/guitarist Sharp has been influenced in equal parts by the Beatles, the Who and Josie & the Pussycats. 1301 Highland Avenue is like an island of power pop in a musical world that is too often mired in the ghettos of rap and the trailer parks of grunge. Catchy tunes abound here, from the churning "Break Down These Walls" (also on Big Deal Records Yellow Pills compilation) to the bouncy meditation on the confusion of being in love, "Underground." He also knows his way around a ballad, with "Not Afraid of Love" as one of the stronger tunes here. Sharps falsetto vocals also make an eerie contrast with the Bowie feel of guest musicians and fellow pop lovers The Rubinoos on "In My Dreams Tonight" and "Magic."